Provisional Honduran President Roberto Micheletti has accepted an offer that an independent commission help broker an impasse over whether to allow the return of ousted President Jose Manual Zelaya, Costa Rica’s foreign ministry said Tuesday. The United States, United Nations, Organization of American States and the European Union have condemned the coup and demanded that Zelaya be returned to power. Many nations have withdrawn their ambassadors, and the United States and the World Bank have suspended some aid. The OAS on Saturday suspended Honduras’ membership for refusing to reinstate Zelaya. 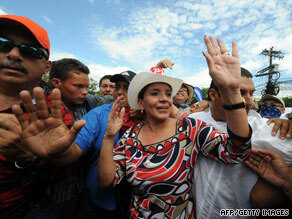 Zelaya said Monday night he will try to return to Honduras again after a series of meetings in Washington this week. He failed in a attempt to return Sunday when the government of Micheletti, the provisional president, prohibited his airplane from landing. Watch the Honduran military block the runway » Zelaya said he wants to return, even if it means being arrested. “I have never hidden from justice,” he said. A trial and a chance to defend and clear his name would be a possible resolution to the conflict, Zelaya told CNN en Español. “I have not committed any crime,” he said. Micheletti has rejected the characterization of the transfer of power as a coup. The military action against Zelaya, Micheletti has said, was backed by a court order, and arrest warrants have been issued against Zelaya for violating the constitution. In brief televised remarks Monday night, Micheletti remained steadfast that his government is upholding the nation’s constitution. “We have demonstrated we are a country of laws, which must be followed,” he said. Micheletti sent a delegation of government officials and business leaders to Washington on Tuesday to hold a news conference to explain their position. The ousted leader’s wife, Xiomara Castro de Zelaya, speaking at a protest in Tegucigalpa on Tuesday, endorsed the notion of negotiation. “In this we shouldn’t talk about … vengeance,” she said, calling instead for “negotiation in which we all sit in peace and confidence in this country.” In Lyons, France, Interpol said the arrest warrant, called a Red Notice, seemed politically motivated. “The charges against President Zelaya of ‘misuse of authority; usurpation of public functions; offenses against the system of government; and treason’ were assessed as being of a political nature with no ordinary-law crime element.” The agency also noted that Honduran authorities had a chance to arrest Zelaya themselves. “In addition, an Interpol Red Notice is a request to provisionally arrest a person for the purpose of extradition to the country concerned. According to media reports, a plane carrying President Zelaya was turned away from an airport in Tegucigalpa, where Honduran authorities would have been able to directly serve a national arrest warrant,” the agency said in a release. “If the reports are accurate and the national authorities deliberately failed to carry out the arrest on their own soil, this would also attest to the existence of motives other than the promotion of international police co-operation.” Zelaya supporters continued to demonstrate Tuesday in Tegucigalpa, the nation’s capital. A 19-year-old man was killed Sunday and at least eight people were wounded after security forces fired guns and used tear gas on several thousand protesters who ringed the airport in anticipation of Zelaya’s attempted return Sunday. Watch Honduran protesters mourn teen’s death » In remarks Sunday, Micheletti said Honduras was open to good-faith talks with the OAS but reiterated that his government is legitimate. “We are going to remain here until the country becomes calm,” he said. Presidential elections are scheduled for November. After 18 years of nearly uninterrupted military rule, Honduras returned to civilian control in 1981. Since then, the military has not seemed interested in holding power in the nation of more than 7 million people, about 70 percent of whom live in poverty. Military interventions were once common in Latin America, but civilian governments have held sway since the 1980s. Before June 28, the only other barracks revolt this decade was an unsuccessful 2002 coup attempt against Venezuela’s Hugo Chavez. The military displaced Chavez but backed down days later and allowed his reinstatement.